H. G. (Butch) Kirven, Jr. was born in Sumter, South Carolina in 1945. He is the son of the late H. Grady Kirven and Nell Isbell Kirven. He is married to Diane Adams Kirven. They have one daughter, Lee E. Kirven, a college professor in Lexington, KY. The Kirvens have lived just north of Simpsonville since 1977. Mr. Kirven grew up in Anderson, SC, where he attended public schools, graduating from T. L. Hanna High School in 1964. 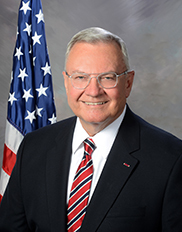 He then attended Presbyterian College, graduating in 1969 with a BA degree in history, and later graduated from the US Army War College, the Army’s graduate school for national security issues. He taught history at Crescent High School for one year before entering the banking business with Fort Hill Federal Savings and Loan in Clemson, and in 1973 moved to Greenville as a commercial loan officer with NCNB. In 1976, he established the Kirven Company, a sole proprietorship, providing real estate appraisals, still in business today on a reduced basis. In 1969, Mr. Kirven was commissioned a second lieutenant in the SC Army National Guard, serving continuously until his retirement from the Army in 2003 with the rank of brigadier general. His military career included a variety of staff and command assignments at the battery, battalion, and higher echelon. He was among the first general officers called to active duty after the 9/11 attacks on the United States serving first as a special advisor to the US FORSCOM commander on air and missile defense readiness, and then as the deputy commanding general of the 263rd Army Air and Missile Defense Command as part of Operation Noble Eagle. Mr. Kirven has been active in the community through the years having served as a member of Greenville County Council, District 27, since 2005. He also served on numerous boards and committees including the County’s Finance Committee, the Greenville Pickens Anderson Transportation Policy Study (GPATS), Greenville Area Development Corporation (GADC), Upstate SC Alliance Executive Committee, Honorary Chair of the Greenville County Joint Veterans Council, president of the National Guard Association of South Carolina and president of the Presbyterian College Alumni Association. He and his wife are members of Greenville’s First Presbyterian Church. Mr. Kirven enjoys working on his small farm, reading, thinking, listening, watching Braves baseball and college football, and going places with his wife, Diane. They have a dog, a boxer adopted from Greenville Animal Care named Wellington, and a cat named Rocky.